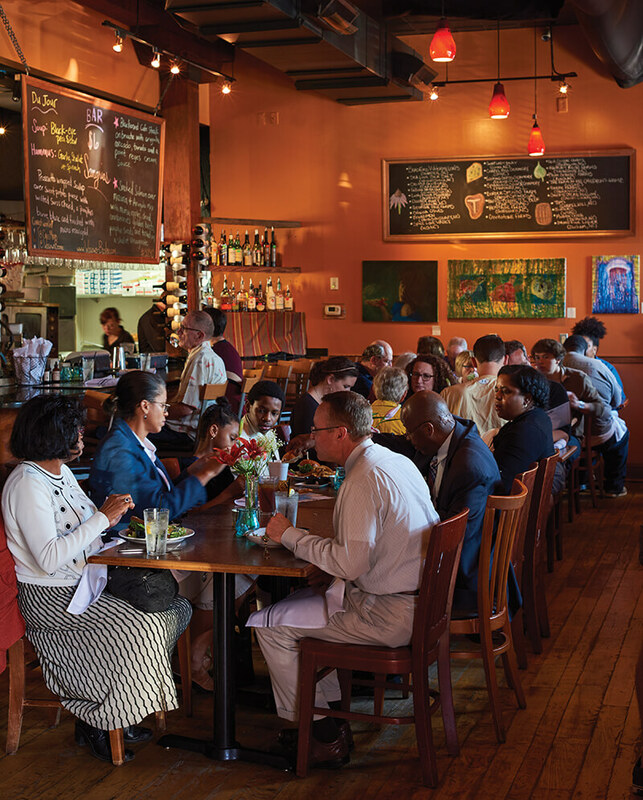 Raised on Southern comfort food and trained in traditional culinary arts, a chef in Winston-Salem brings the best of both worlds to his menu at Willow’s Bistro. Travis Myers didn’t know how to pronounce crème brûlée. He was 25 years old, a first-year student at the esteemed Culinary Institute of America (CIA) in Hyde Park, New York. He didn’t know how, exactly, he ended up there, either. For years, Myers had managed various operations for The Gap. He thrived as a leader, but hadn’t found his niche. Then a coworker brought up the CIA — one of the best culinary programs in the world, right in the area. So he enrolled. Almost 14 years later, he’s still laughing about that lunch. Today, he wears a T-shirt that reads, “It’s Pronounced Pee-can,” and sits at the far end of the bar at Willow’s Bistro in Winston-Salem, where he’s the executive chef. The restaurant hired Myers last year to reinvigorate the seven-year-old operation. Willow’s menu has blossomed under Myers, who loves stirring innovation into familiarity. When he enrolled at the CIA, Myers was the one with all the questions. He spoke cooking fluently — just a different dialect from his French-focused textbooks. Born and raised in Davidson County, Myers cherished Southern culinary traditions and flavors. When he married his wife, his grandmother MeMe put together a cookbook of her family-famous recipes for him — chicken and dumplings, sugar-coated peanuts, cold oven pound cake, and black walnut cake, made with nuts foraged from the backyard. French fundamentals often correlate with Southern comfort. Crème brûlée, for instance, is just vanilla custard, fancied up with a sugary beret — the overseas cousin to American pudding, which, thanks to MeMe, Myers knew well. During that first year, Myers and his friends at school held a potluck, to share recipes and show off skills. He made banana pudding for all the Yankees. Of course, they couldn’t get enough, especially the one who’d corrected his pronunciation of crème brûlée. “What is banana pudding? !” she exclaimed as she devoured the dish, bejeweled with wafers, crowned with soft cream. Instead of correcting her — it’s ’nana puddin’ — Myers just smiled: “Exactly,” he said. Willow’s Bistro lives in a former railway freight warehouse, built in 1913. The building’s history seeps into the restaurant’s soul: lofty ceilings, raw brick walls, a porch-like patio where guests can drink and dine, soaked in sunlight. The walls are burnt orange, adorned with for-sale paintings from a different local artist each month. Daily features and locally supported farms and vendors are scribbled on mammoth chalkboards. And the kitchen is in the center of it all — exposed and abuzz, like a beehive. Will Kingery and Norbert Cooper opened Willow’s in 2009. 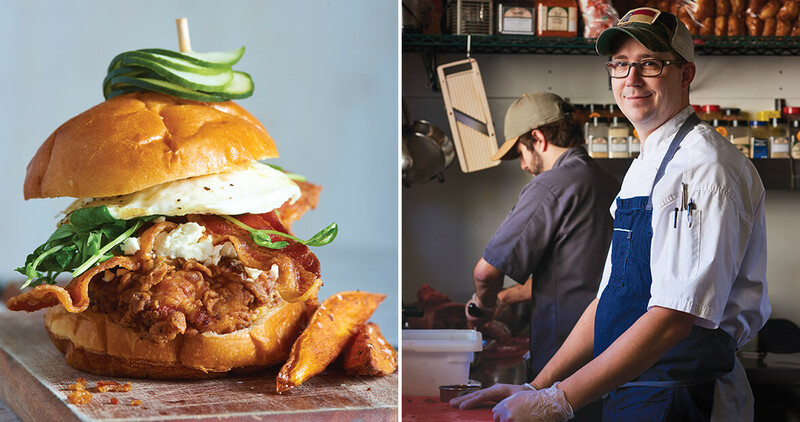 They craved casual, neighborhood comfort, coupled with honest, local, seasonal ingredients. In the years since, Kingery opened King’s Crab Shack & Oyster Bar, and adopted ownership of Silo Bistro & Bar. Dubbed after his culinary school nickname, Willow’s always felt personal for Kingery — but as his ventures expanded, his time shrank. He needed someone who could not only take charge, but also take care of the restaurant, every day, like he used to. To Myers, the vision is simply ardor — about, well, everything. “I hire people who can learn,” he says, “and who care.” About where ingredients come from and for whom they are cooked. About the neighbor who calls the kitchen to stop by and borrow a cup of panko. About the charity event the next day, when employees will work on their days off. Myers’s passion seems not just to echo Kingery’s, but to spread, like wildfire, among his staff. When he left River Birch Lodge, a couple of his protégées even followed. Sous Chef Brent Andruzzi is one. As Myers portions short ribs, Andruzzi dashes between lunch service and sheet pans of plump, roasted olives, which will soon be doused with rosé vinegar. When asked why he stuck with Myers, he glances between cilantro microgreens and his mentor, then says, “Freedom,” before rushing back to the stove. Willow’s menu has blossomed under Myers, who loves stirring innovation into familiarity. The community, it seems, can’t get enough. Since Myers started, business has almost doubled. And you only need to scan the menu to start to understand why. Salt-and-vinegar pork rinds. Bradford watermelon red molasses fries with cheese from Goat Lady Dairy. Crawfish and grits with roasted tomatoes, andouille sausage, and tasso ham. Cocktails infused for months in a barrel from Top of the Hill in Chapel Hill. And bourbon crème brûlée. Like his pronunciation, Myers’s recipe has a deep, proud Southern accent. It sounds good here.